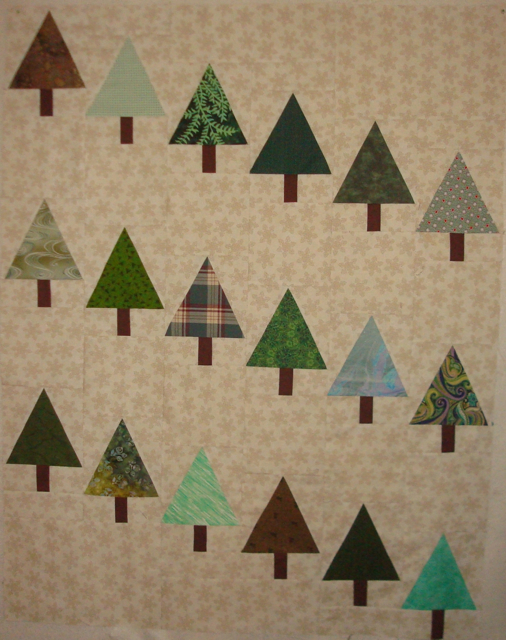 My Modern Trees kit… for when I am able to go back and actually do the quilting. 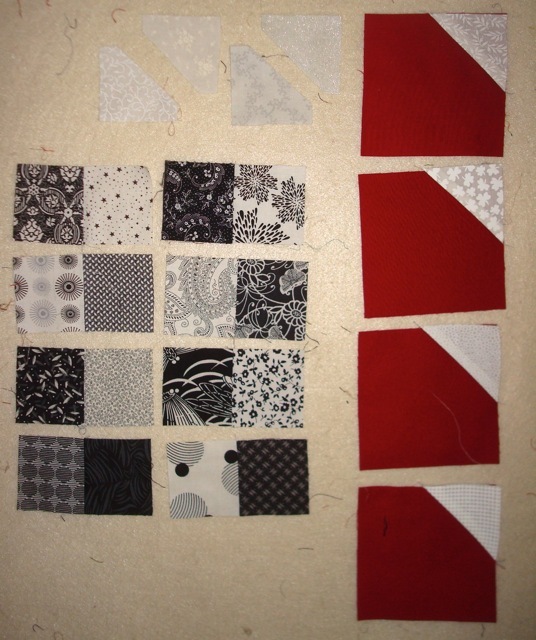 It includes the top, the quilting patterns I drafted and the backing. We don’t get trick-or-treaters in the apartment complex where I live. Well, not usually, but when we do, they are usually little kids from our building with their parents. I love seeing the kids dressed up and hanging with their parents. It’s the one day where they are encouraged to say “hi” to their neighbors instead of just hiding their faces shyly in Dad’s shirt. And, of course, Halloween is the day before November and the holiday season. This November, I’m going to try something a little different. I am clearing my decks so I can work on my writing. I signed up for NaNoWriMo which is National Novel Writing Month. Yes, I am going to attempt to write fiction every day for a month… possibly even the 50,000 words required by NaNoWriMo. Wish me luck! This isn’t to say that I am abandoning my quilting. I am returning to my “15 minutes of quilting a day” routine (as I wrote about when I started this blog.) My project is a tribute to the late Mary Ellen Hopkins. I haven’t named it yet. In the second stage, I have sewn the squared-off triangles to one corner of the 4.5″ squares and paired up the black and white 2.5″ squares. 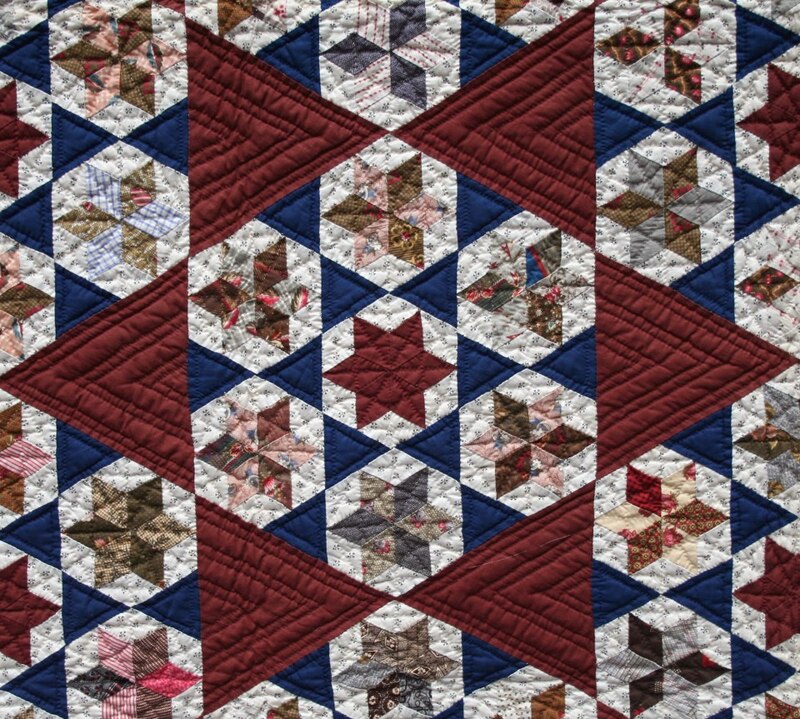 In stage 3, the black and white squares are sewn into 4-patches, and the other half of the squared-off triangles have been sewn to the opposite corner of the 4.5″ squares, forming the “Kansas Dugout” block. I paired up 4-patches and Dugout blocks in stage 4. 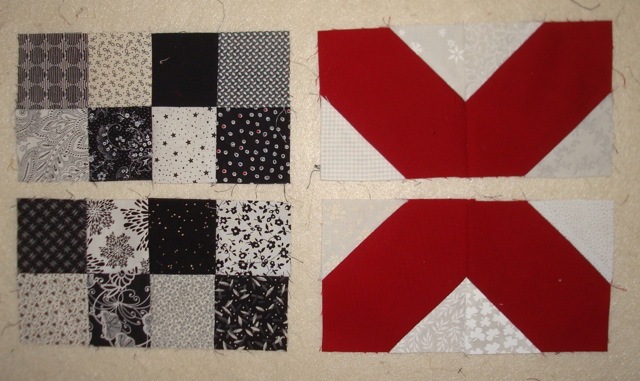 In the final stage, the 2 x 4 rectangles are paired up to form the 16-patch block, and the 2 pairs of Kansas Dugout blocks are sewn together to form an X. 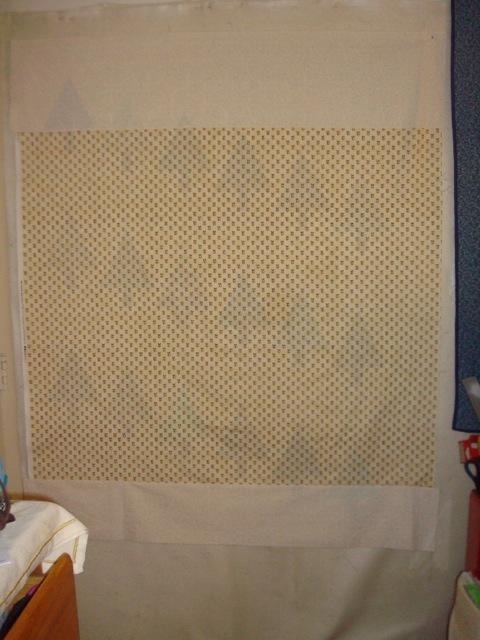 This is where I will set it aside until I have complete enough blocks to make the quilt as large as I want it to be. I set up one block each at each stage each day. I start the day sewing, then press (and trim, if necessary) what I’ve sewn. Finally, I set up for the next day. If I run out of blocks, I use some of the time to cut more. I ended up completely cleaning the machine and oiling it, changing the thread, the bobbin, the foot, and the needle only to end up solving the problem by accident. It turns out that the Merritt doesn’t like to change the tension if the stitch dial is on 0, so if you’re having tension problems, fiddling with the tension AFTER setting the stitch length to 0 doesn’t help much. In the beginning, I had the tension gauge up to 9 (as high as it would go), and was still having stitch “dots,” “slubs” and skips on the back. Since this was happening both on Barbara (the Singer 99) and the Merritt, it was a real head-scratcher to me. Faux flange binding for the place mats. 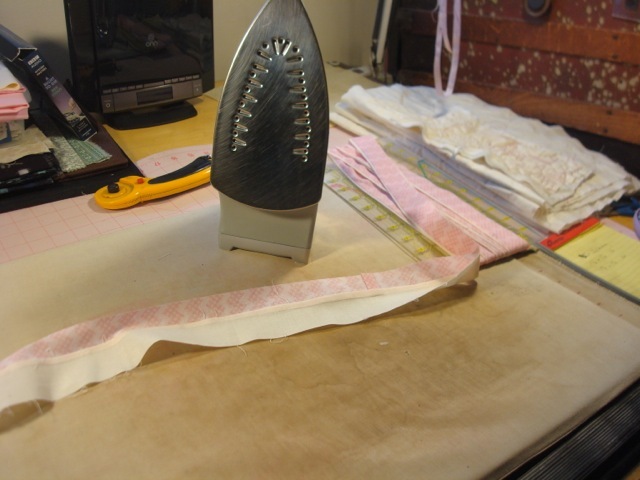 Notice how I am using my old ruler to wind the long binding as I iron it to keep it from tangling…I never seem to be able to throw anything away and in this case, I was happy to find some use for it. Eventually, I set aside the free-motion quilting to work on the binding for the placemat project I was testing a while ago (I had already sent in my report, I just hadn’t finished the placemats.) I corrected tension while joining the strips, and the long seam joining the strips ended up perfect, with no skips or tension issues. whoo-hoo! To tame the binding I was going to grab one of my random pieces of cardboard, but I laid my hand on my old cutting ruler instead. I’ve had this one for many, many years (probably 15) and the marks on the edges have started to wear off. After I had started winding the binding on it, I realized that this was a really good idea. Not only did it keep my binding from getting twisted and tangled, but it also gave me an idea of how long it was (just count the folds on one edge and multiply it by 2 feet. Having finished one of the free-motion cables for the edge of the placemats, I was looking at the end and feeling a bit dissatisfied with the way it came out. (Of course, between the tension issues and my lack of free-motion quilting skills, there was much to be dissatisfied about.) I decided to take a page from my friend Cricket’s book: to stabilize the edged using a coarse zigzag. In the middle of fiddling with tension issues, I re-discovered the fact that a coarse zigzag around the outside of a project helps keep the front edge from ruffling. Not only did this keep the edge from rippling after quilting, but it also helped keep the edges firmed when I trimmed the placemats and added the binding. I just made sure the zig-zag was within the 1/4 inch seam allowance, and even if it was off the “placemat top” onto the batting on one side, the stitches that weren’t cut away held long enough to keep the back from shifting as I sewed on the binding. Winding your binding around an old ruler can help you keep it from tangling and give you an estimate on how much you have. 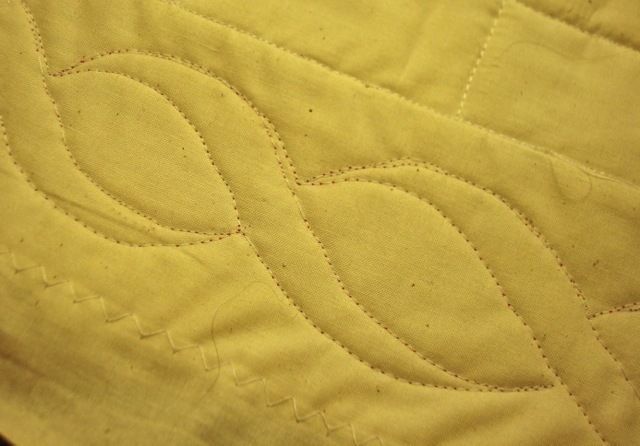 If you’re having trouble with the tension while free-motion quilting, try increasing your stitch length. I know that with the feed-dogs covered or dropped, it shouldn’t make a difference, but sometimes it does. 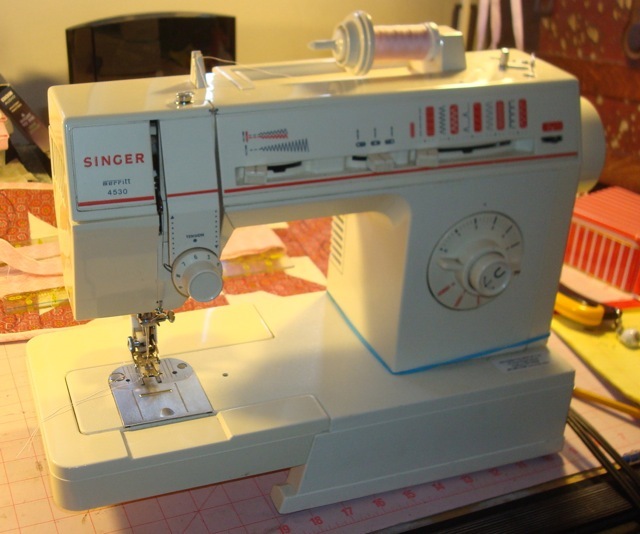 If that fails, go back the the beginning: set the machine up for “regular sewing” and, very careful retrace your actions setting it if for free-motion quilting. Aiming for Accuracy with the final borders on. Now it moves to the bottom of my quilting queue. Who knows when I’ll get to it. After trying to machine quilt on two different machines, I have given up (for now.) 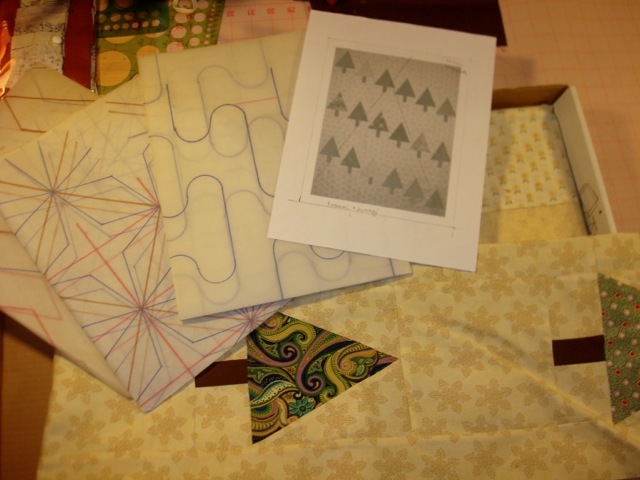 I was hoping to get the placemats I made to test directions for The Quilt Pattern Magazine quilted and bound. So, I hauled out Barbara and applied the Super Slider my friend Sharon gave me to test (since Barbara’s “bed” is not smooth, I had worked with Saran wrap around the bottom of the machine the last time.) The Super Slider worked much better than the Saran wrap. However, no matter what I set my tension at I had problems with the stitches showing at the back AND the machine skipping stitches. What brought this to my attention was that the thread was shredding and blobbing. That (mostly) stopped when I started using a needle with a REALLY BIG EYE. I cleaned. I oiled. I changed the needle (several times.) I even opened up the tension dial (probably a mistake on my part) to see if anything was stuck in there. No change. Okay, so I’ve got another machine I can use: the Singer Merritt. Unfortunately, to get a “proper” stitch, I had to dial the tension all the way up to 9! …And it was also skipping stitches. What is wrong with me? In fact, I had to use Tension 9 to piece the backing for Modern Trees. This is just ridiculous! I’m a little afraid to touch the Featherweight in case my tension issues spread there. 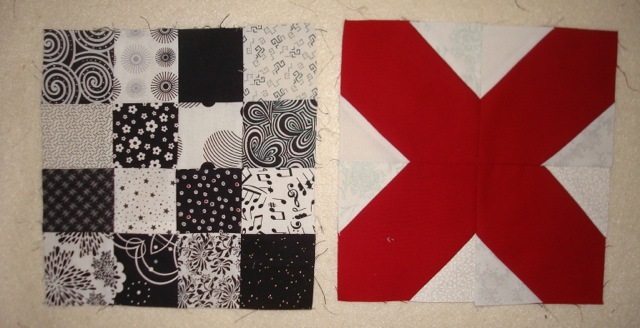 So, other than these two pieces, I really haven’t done much in the way of quilting. I’ve been lazy about writing, but I have been progressing on some projects…mostly the Quilt-Alongs. This is the progress as of this past Thursday. I have since added the borders, but haven’t been able to take a picture of it. Finally, if you’re in the area, my Guild is having a show.Since it’s in the Spring, I figure I’m giving you plenty of notice! 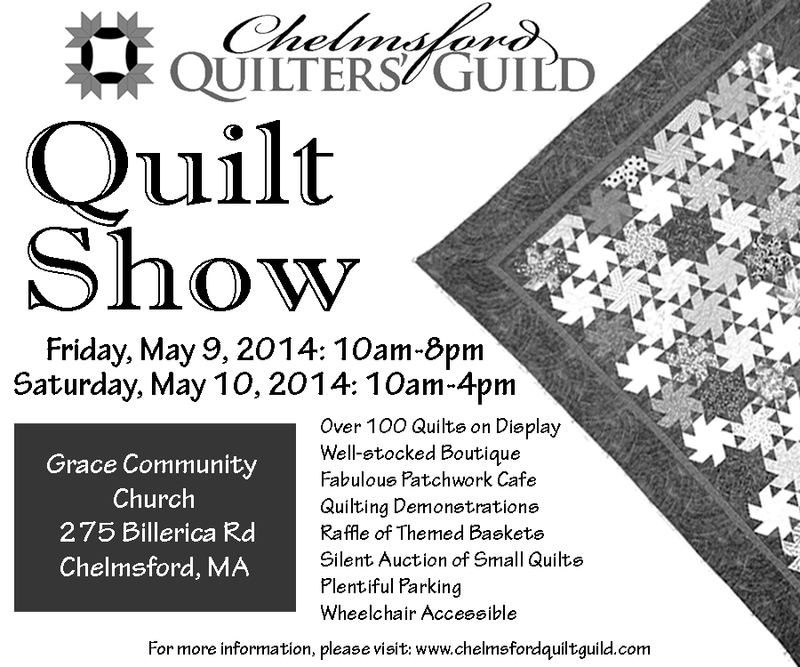 Why, yes, that is Catherine Wheels in that ad for my Guild’s show. 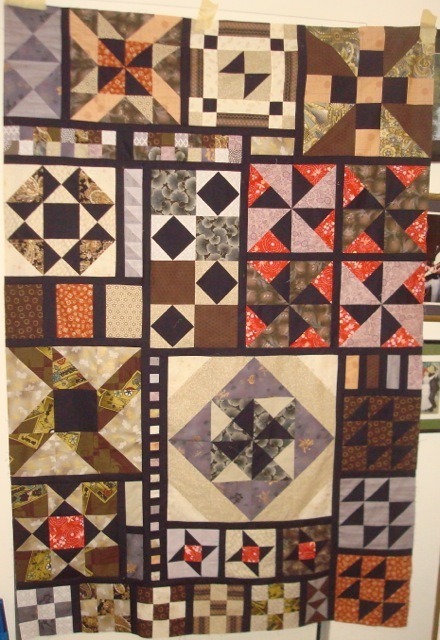 I’ve been contemplating what “moves” me as a quilter. What energizes me. What propels me to the end of a project. What drives me to start another. You see, my motivation is drying up. I feel like the projects I’m working on now are not very stimulating. I keep making excuses not to call up Cricket and ask if I can put something on the long arm. My “new” projects all involve using up/finishing already started projects. I am “stalled” in the marking of the Xmas Dear Jane. Projects I am actively working on have already been (mostly) designed and simply have the “rote” part to be done. Fabrics have been pulled and cut. All that’s needed is the pieces to be sewn together. So, I decided I needed to go back to the beginning. Maybe that will help motivate me to be happy with what I am doing, quilt-wise. 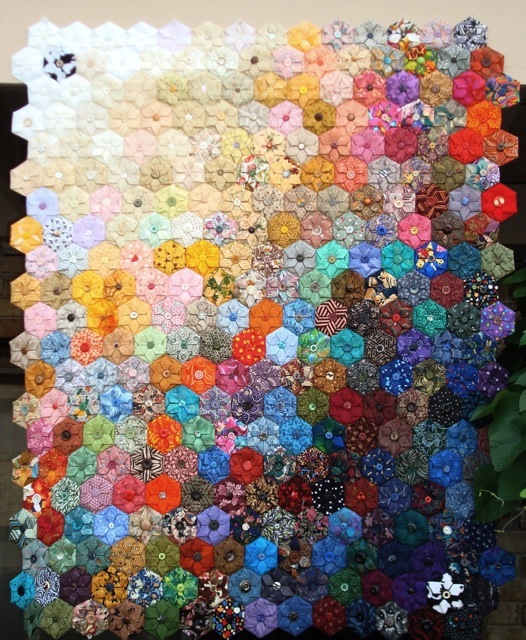 What is it about quilting that inspires and intrigues me? I was working at a place that developed and sold computer typesetting systems. I worked in the typography department. At that point, everything was black and white, so coming home and “playing with color” was relaxing and stimulating to me. Like other quilters, I find fabric shopping inspiring. Not just visiting fabric stores, but also pawing through other people’s scraps. I think this is why I’m still working with the squares I was given from my Guild’s Comfort Quilts. But, I’m coming to see that it’s not just color that inspires me. After all, I’m working with color for Aiming for Accuracy and, even though I’ve kept up, I still feel uninspired for the rest of my quilting. When I was young, I used to work on jigsaw puzzles with my Dad. We all did, I suppose, but my enjoyment of them lasted longer than my sister or brother. I think putting together a quilt is, in some way, related to putting together a jigsaw puzzle for me. It’s probably why I like looking at vintage quilts and trying to determine how they were made. 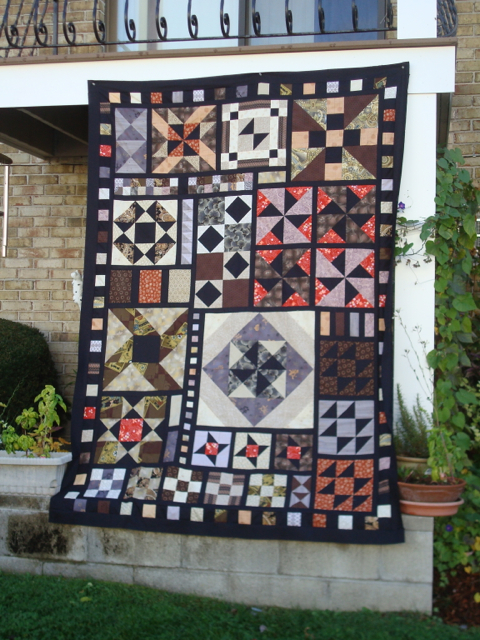 It’s one of the reason that, while I write patterns and test them, I seldom actually use patterns to make my quilts. I like the “figuring out” part and, yes, I like the math. 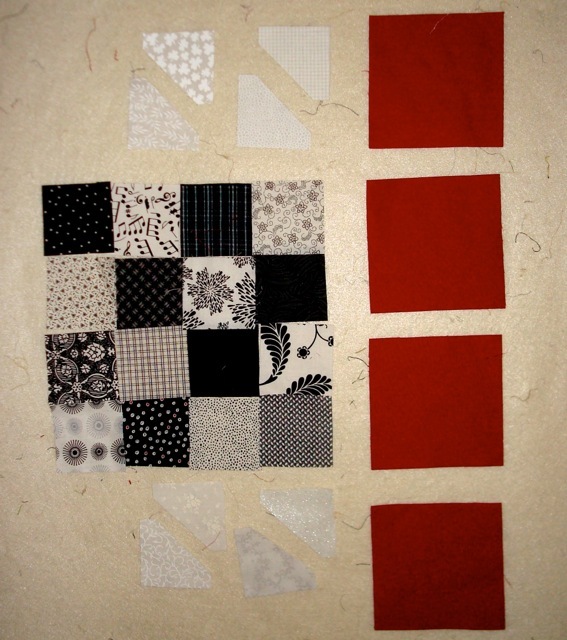 So, maybe I need the a level of “figuring out” to make me happy when working on my quilts. 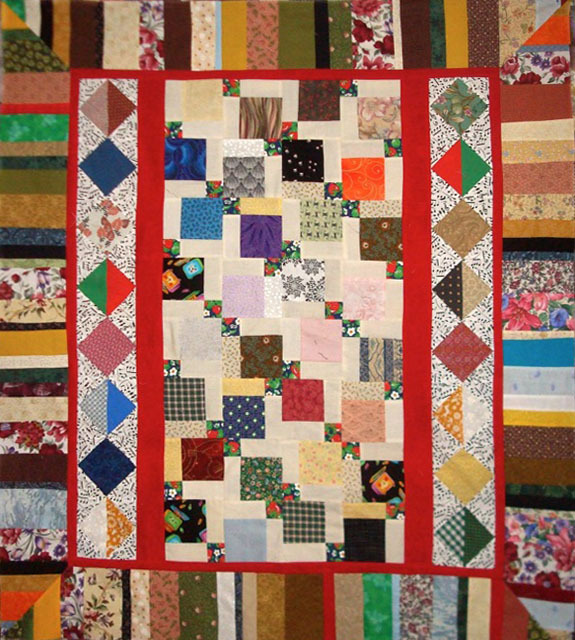 That’s probably what drew me to Cross Roads, and, maybe finding another quilt or block to “break apart and put back together” will assuage the restlessness I feel when working on my current projects.